Much of the country looks like a fairy-tale themed pop-up card. Travelling through the counties of Kildare and Westmeath, I enjoy the medley of green and blue through the bus window. Today is one of Ireland’s rare sunny days, with wispy clouds emphasising the brilliant blue sky. The landscape, despite all my attempts to resist it, brings the clichéd phrase “rolling hills” to mind. No other words serve as well to describe the undulating meadows. Low slopes are covered in grass; fields polka-dotted with sheep and cows reared for both milk and meat. Lone trees stand in the meadows like stocky sentinels. Zigzagging hedgerows, dark green against the neon grass, divide the fields into smaller parcels. Once serving as boundaries, the hedgerows are now a hinderance for farmers who use modern machines. Yet they stand, protected by law and local lore. Besides having a variety of shrubs that attract birds, insects and small animals, the hedgerows are also known to be the home of the fairy people. When guide John Kennedy mentions the “wee folk,” my ears perk up. Stories of mischievous leprechauns and other little creatures come from the Tuatha De Danann, an ancient tribe that ruled Ireland for two centuries around 1800 B.C. Their ancient gods lost importance with the coming of Christianity, but stayed alive in popular belief as the fairy folk. Not just alive but thriving, Kennedy claims, passing around a laminated newspaper cutting. It is an article about a dip in a road in County Kerry that keeps reappearing despite repairs. A local councillor blamed the mysteriously recurring flaw on a fairy fort. Fairy forts are the round circular dwellings that the Tuatha De Danann built. These, the hedgerows, and the lone trees (usually hawthorns), have remained unviolated because of the respect and fear people still have for fairy folk. “When I was a kid, my grandma always warned me to stay away from the places of the fairy folk,” Kennedy says. Whether they believe or not, nobody wants to risk crossing the fairies, which is why some years ago in County Clare, the construction of a road was delayed for nearly 10 years, and then finally rerouted to avoid cutting a fairy tree. As he finishes the tale, our group of international journalists reaches the Hill of Uisneach, a place the signboard proclaims the “mythological and sacred heart of Ireland.” Though only 600 feet above sea level, the hill has a grand view that, Justin Moffat, our guide to the site, tells us includes 20 counties on a clear day. Moffat is dressed in a tweed coat; a feather stuck rakishly in his hat. Holding a staff of knobby wood topped with a ram’s horn, he looks like he’s stepped out of the pages of a picture book. Relics found on Uisneach date across five millennia, indicating that it was held sacred by successive civilisations. It has been the burial site of gods, a gateway to other worlds, the location of a palatial hill fort, and a place of gatherings. Taking us on a tour of the highlights of 40 surviving features on the hill, Moffat animatedly narrates tale after tale. 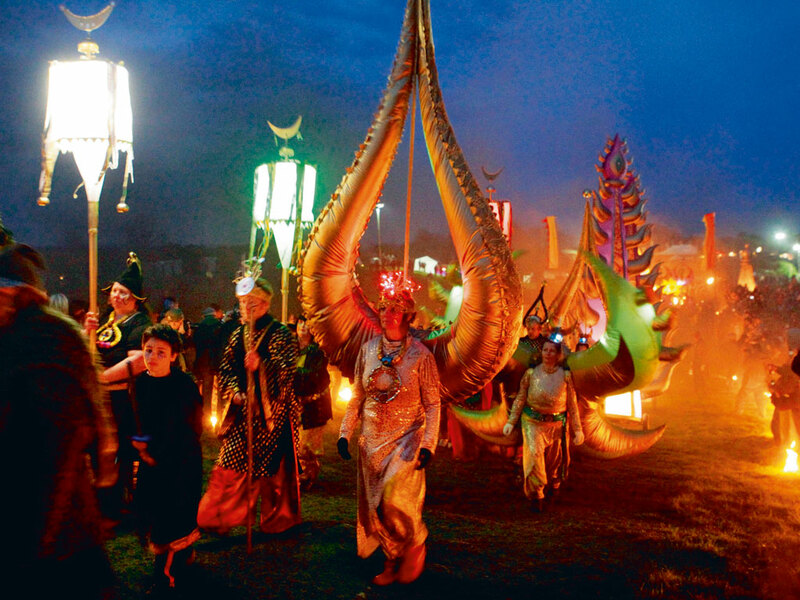 The names and dates become a jumble in my head as I picture warriors kneeling before kings; Danu, the earth goddess, ushering in spring; and scores gathering for the lighting of the great fire on the first day of May. Walking on a path lined by berry-laden hawthorn trees, past cows that turn to look at the visitors, the magnetism of the place is undeniable. 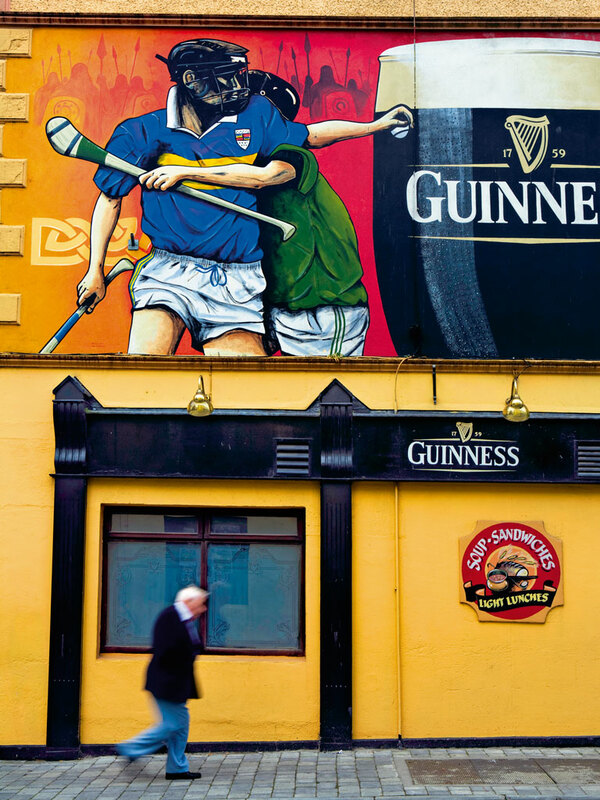 In Ireland, the past and present are never really far apart. And nowhere is this more apparent than when road-tripping through the country’s ancient east, where multiple threads of history intertwine. The walls of the castle’s reception are lined with family portraits. Muskets and swords hang at one end, while a rocking horse, its wood worn smooth by many baby Pakenham bums, stands by the opposite wall. Our hushed voices resound in the high-ceilinged room. My favourite part of the evening is after dinner, when Pakenham presses a panel in the dining room wall to open a hidden door to the library. Floor-to-ceiling bookshelves line the room. Our dance through the centuries continues the following morning, when we waltz straight into 630 A.D., pursuing yet another thread of history. At its peak, the Benedictine abbey at Fore was home to about 300 monks and 2,000 students. The abbey was burnt, rebuilt, and burnt 12 times, and the oldest remaining structure here is the lichen-covered ruin of the A.D. 900. St. Feichin’s Church, adjoining a large yew tree and a graveyard. Across the road is a 12th-century priory, the path to it full of twists and turns. A separate little path leads to an ash tree beside what used to be a clootie or holy well, with hundreds of strips of coloured cloth—clooties—tied to it. There are socks and trinkets, and even a tiny teddy bear in a chequered blue-and-white smock, left by those who believe in the well’s power to heal their loved ones. From there we speed on to Carrick-on-Shannon, a colourful little town by the River Shannon. At the Oarsman Restaurant, a pub just off the waterfront, while having my first pint of frothy Irish Guinness, I note the many ways the historic, mythological, and contemporary worlds meld together. Like the councillor who blamed a faulty road on fairies, and the believers who tied strips of cloth near a ruined abbey, the Irish seem to find their own way to hold on to tradition. For Kennedy, our guide, it’s through the bodhran, an Irish drum rather like a dafli. At the restaurant, he joins the house band playing traditional Irish jigs and reels. We continue our journey, travelling even further back in time. 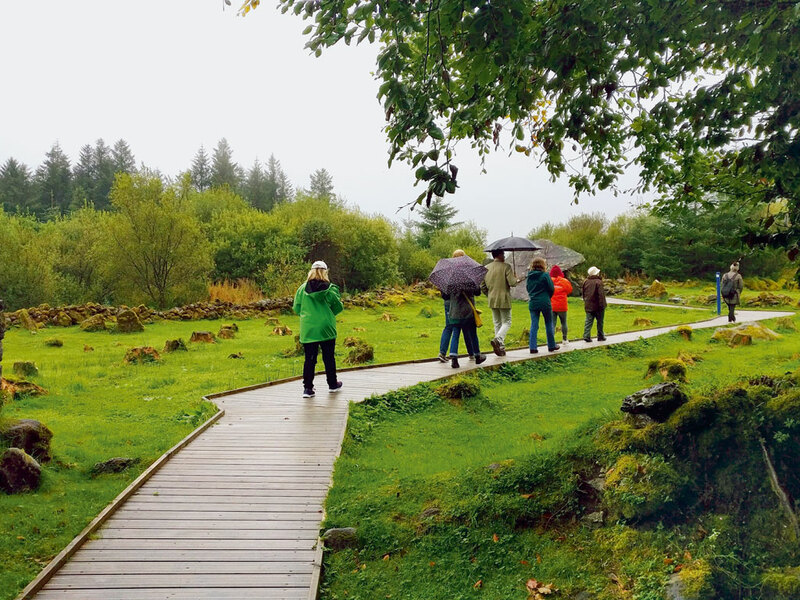 Walking on a raised wooden boardwalk through a misty landscape of karst rocks and red-tipped grasses, we get a crash course in pre-historic geology. 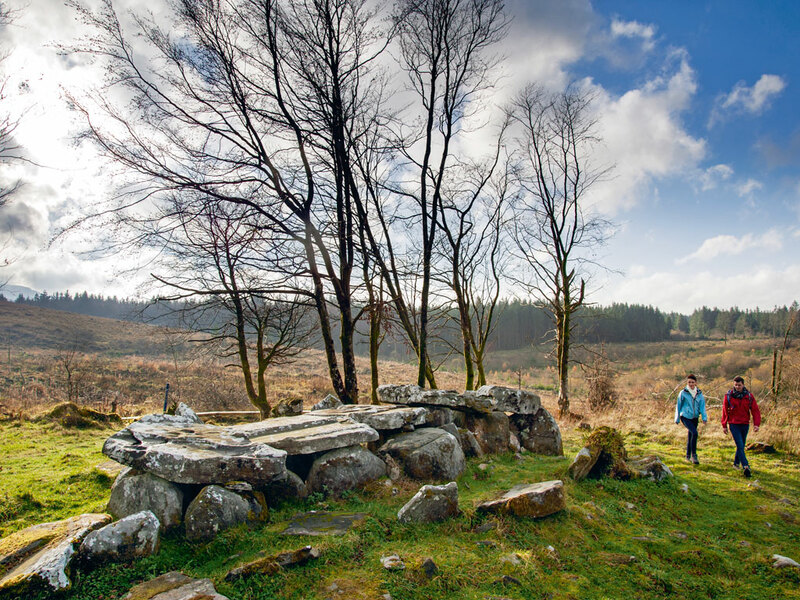 Cavan Burren Park is part of the larger Marble Arch Caves Geopark, listed as a UNESCO World Heritage Site. The relict landscape is replete with stories that historian and guide Jim Nolan interprets for us. He shows us the giant stones that are glacial erratics left by powerful Ice Age glaciers. He points out fossils in the limestone that indicate the ocean was once here. He weaves tales of fairies and folklore that make us forget the wind and rain. As the trail descends through a gorge, among moss-covered trees, he talks of two young giants called Lugh and Lag, who were in love with the same comely giantess. To prove his prowess, Lugh jumped across the chasm, landing safely on the other side. Vying to outdo him, Lag jumped backwards, and fell to his death. The gorge is known as Giant’s Leap, and the place where Lag is said to be buried is a megalithic tomb called Giant’s Grave. Between the stories and the mist, I really feel I am in a primitive land. 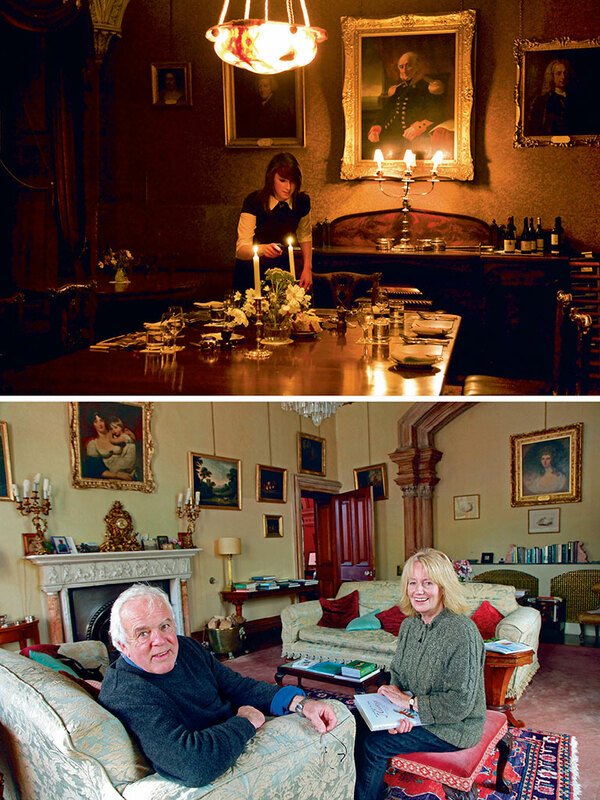 Many of Ireland’s 18th-century country homes are run as guesthouses and B&Bs. We visit Hilton Park in County Monaghan, a 300-year-old family home located among 600 acres of woods, gardens, and lakes. Our hosts for lunch are three generations of the Maddens, who have owned the house since it was built in 1734. Johnny and Lucy Madden opened their doors to guests about 25 years ago, and have since handed over the reins to their eldest son Fred and his wife Joanna, who live here with their four children. The house is scattered with antiques like a painted leather screen, four-poster beds, oriental cabinets and old issues of the London News. Stained-glass windows soften the sunlight streaming into the rooms. Our last night in Ireland is spent in an even grander setting, at Castle Leslie, also in County Monaghan. Famous as the place where Paul McCartney married Heather Mills, it is an imposing country house on a 1,000-acre estate. 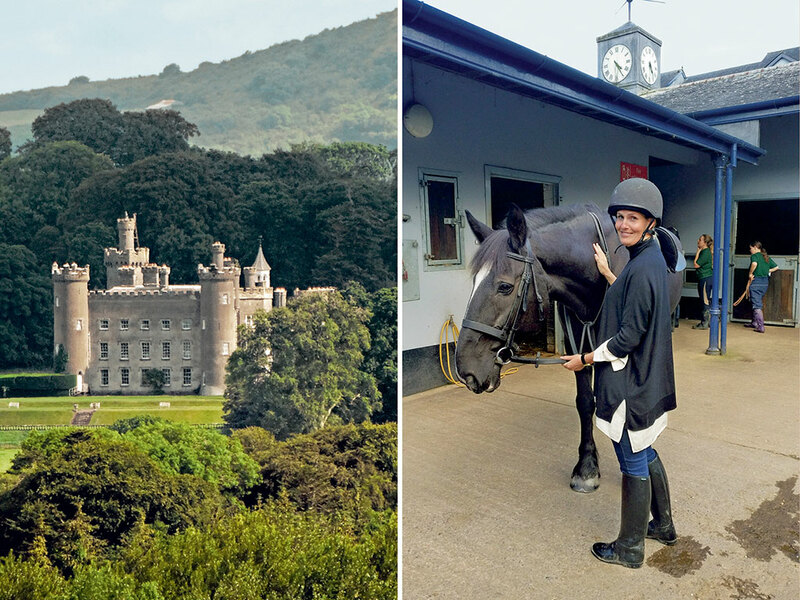 While some of our group’s members sign up for lessons at the castle’s renowned equestrian centre, I go for a walk with the estate’s head gardener, Dessie Clements. To him, the grand old trees in the estate are like living characters with their own origin stories and unique traits. While most folks use buildings as landmarks, he maps the estate by its beech, oak, cedar, sycamore and giant redwood trees. In fact, many of the ancient trees on the estate are listed on the Tree Register of Ireland. I’m taken in by one particularly robust specimen with thick low branches spread out in a welcoming embrace, a bit like Shah Rukh Khan’s signature pose. The castle itself is a maze, with one magical room leading to another. The drawing room with the intricate mantelpiece leads into the dining room with the long table. Tea tables stand on the conservatory’s chequered red-and-black floor, while the bar is located in a long gallery with frescoed walls. A fire crackles cosily in the reading room. In the cheery Nursery Room, one wall is painted to look like a dollhouse, camouflaging the doors to the bath and toilet. The Red Room, where McCartney and Mills stayed on their wedding night, has the first bathtub installed in Ireland. In the bus on the way back to the airport the next day, I ponder how the various threads of history that we pursued meld together in a joyful jumble of cherished traditions and beliefs born from them. Leafing through a picture book of children’s tales borrowed from Kennedy, I find its pages filled with stories of giants and curses that turn children into swans. My gaze turns outside, where the sky is blue again after several days of rain. It is, as though, the stories in the book I’m holding start to unfold. Solitary hawthorns reign over meadows, colourful ribbons representing wishes fluttering from their branches. And a copse of trees on a low mound appears on the landscape, indicating the presence of a fairy fort. 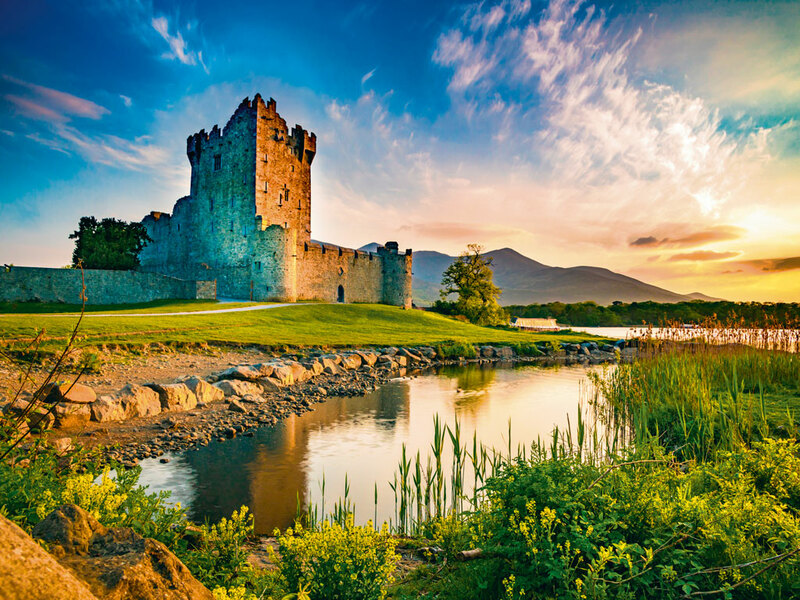 Located in the North Atlantic, Ireland is Europe’s third largest island. The two most important cities on the island are Dublin, on the eastern coast, and Belfast, on the northern tip. There are no direct flights from India to Dublin. Convenient connections are available via Middle-Eastern and European hubs. 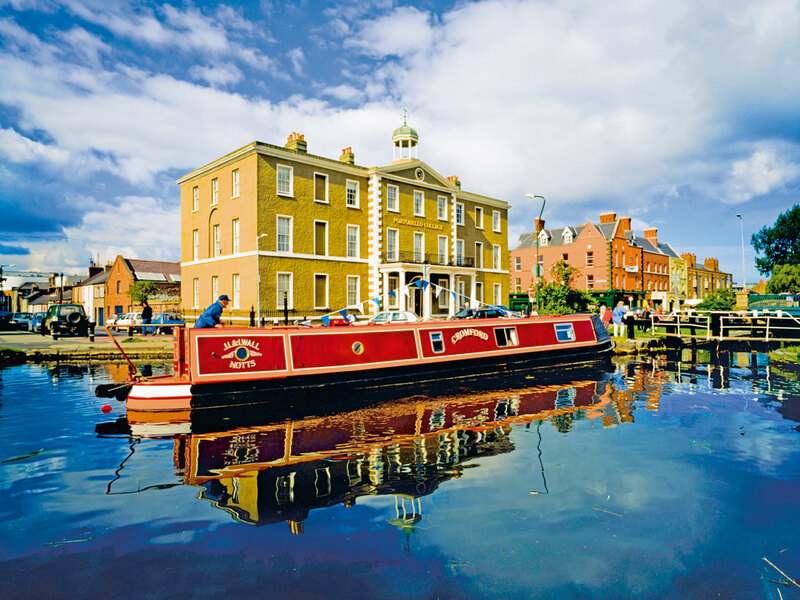 Tip: Use Aircoach to travel between Dublin and Belfast (www.aircoach.ie). Neha Dara is a travel writer and editor. She is happiest trotting off the beaten path, trekking in the Himalayas, scuba diving in Andaman & Nicobar, or exploring local markets in small towns. She tweets as @nehadara.